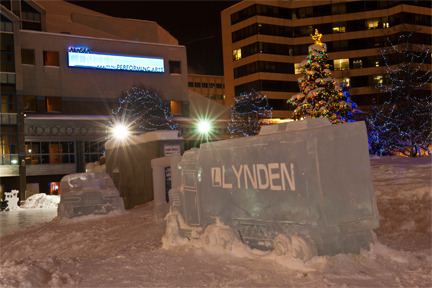 Each year, Lynden Transport partners with the Alaska Railroad to move huge blocks of ice from Fairbanks to downtown Anchorage for the annual Crystal Gallery of Ice Carving Competition. 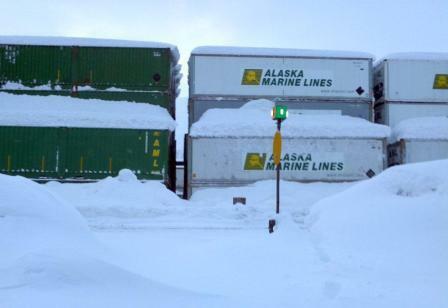 “The ice, called Arctic Diamond, is highly prized for its clarity,” explains Paul Friese of Lynden Transport in Anchorage. The Lynden truck above was sculpted by a Chinese championship team in appreciation of Lynden’s contribution to the ice carving event each year. 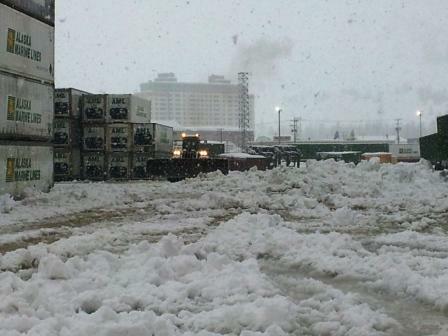 Once the blocks are cut they are loaded onto Lynden trailers at the harvest site. Lynden’s Fairbanks employees transport the pieces, measuring approximately 3 feet by 6 feet and weighing from 3,500 to 5,000 pounds each, to the Alaska Railroad where the trailers are loaded onto flat cars for the trip to Anchorage. 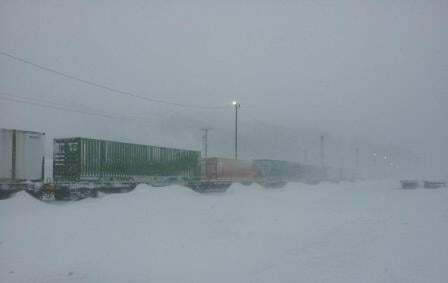 Once they arrive in Anchorage, the trailers are offloaded from the flatcars and the Lynden team hauls them to the event site. The Crystal Gallery of Ice is an annual event organized by the Anchorage Downtown Partnership, Ltd. and hosted in Anchorage’s Town Square. "Our site manager made a point of telling me how wonderful Operations Supervisor Andy Collins was to work with during the delivery of the ice for this year’s event", says Cheri Spink, Events and Development Director of Anchorage Downtown Partnership, Ltd. "This has been true of my experience working with Paul Friese and the Lynden staff over the past seven years. 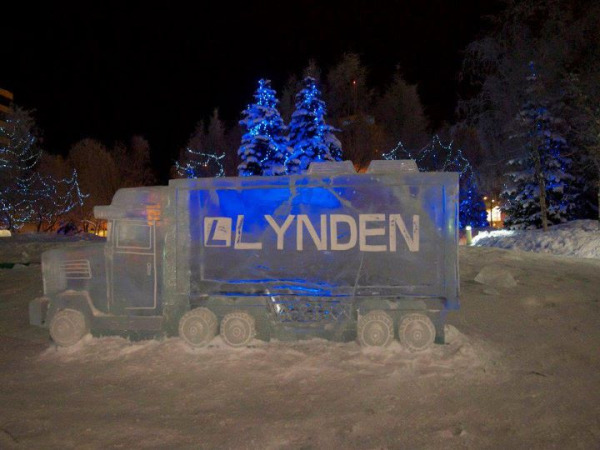 Lynden Transport is a great community partner and an integral part of the success of the Crystal Gallery of Ice." Photo credit: Kodiak Chamber of Commerce. A piece of Alaska railroad history is now back where it belongs. In December, #557, the last operating steam locomotive in the state, made the journey from a museum in Moses Lake, WA to Seattle where it rode an Alaska Marine Lines barge to Whittier. From there it was off-loaded on a flatbed train car to ride the rails to Anchorage (watch the news video) where it now awaits renovation for its next life with the Alaska Railroad. The story of the 160,000-pound locomotive began in 1944 when it was built for the US Army Transportation Corps and then diverted to Alaska to pull trains for the Alaska Railroad. Old photos show the engine pulling passenger trains from the Anchorage depot to Seward in the 1950s and idling at the roundhouse. It made its last run in 1957 to the state fair in Palmer. It was finally sold for scrap. Monte Holm, a well-known local and scrap dealer in Moses Lake, WA, purchased the engine from a steel dealer in Everett, WA in 1964. He kept it at his House of Poverty Museum which showcased railroad-related items and was a tribute to his years of riding the rails as a hobo. According to his grandsons, Monte would run the engine through town pulling local residents and even a few visiting dignitaries in an old rail car that was used by Presidents Woodrow Wilson and Harry Truman. When Monte died in 2006, personal friend Vic Jansen stepped in. 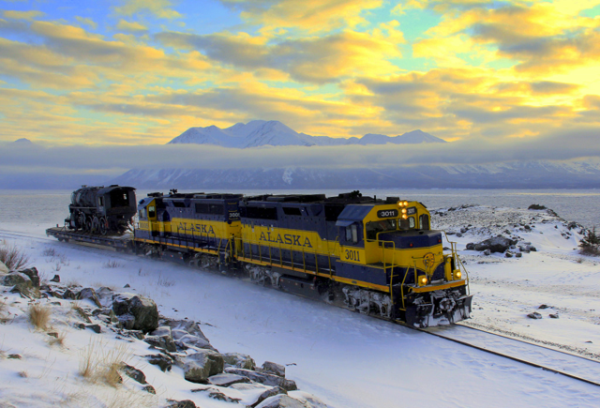 Vic and Jim Jansen purchased the engine and decided to donate it to the Alaska Railroad. "The best thing about the donation of the engine back to the Alaska Railroad is that it will be put back into service for people to ride and enjoy,” Vice says. The Jansens only request was that the engine be restored and operating within eight years and that Monte's relatives be allowed to ride it for free - forever. 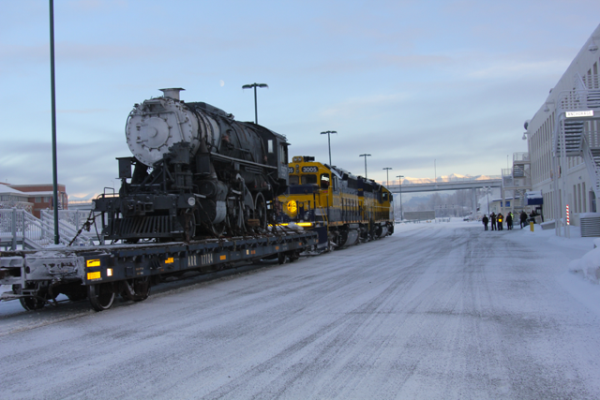 “557 is a significant piece of the Alaska Railroad's history and of Alaska's history as well,” said ARRC President and CEO Chris Aadnesen. "We look forward to working with the volunteers and charitable organizations that will be the front line in getting 557 back on the tracks. It is important to us that we make the wishes of Mr. Holm and the Jansens a reality.” A plaque will be mounted on the engine honoring Monte's efforts to save it from the salvage yard.